The cheapest of the lot is now the Rs 399 Nirvana postpaid plan which offers a total of 40GB monthly data with unlimited voice calls and 100 SMS per day. Users will able to carry forward their remaining data to up to a total 200GB to the next month. Previously, the Rs 389 Nirvana plan offered only 20GB of free data. Vodafone-owned operator Idea has revamped its Nirvana postpaid plans by replacing seven different tariff plans with just four packages. As part of the announcement, Idea will now only offer four Nirvana postpaid plans priced at Rs 399, Rs 499, Rs 999 and Rs 1,299. Idea appears to have removed the Rs 1,599, Rs 1,999 and Rs 2,999 due to poor demand for such a high-value plan since data rates have gone down and so have tariffs across leading operators. The cheapest of the lot is now the Rs 399 Nirvana postpaid plan which offers a total of 40GB monthly data with unlimited voice calls and 100 SMS per day. Users will able to carry forward their remaining data to up to a total 200GB to the next month. Previously, Idea users were offered the Rs 389 plan which only packed in 20GB of free data. Next up, the Rs 499 Nirvana plan offers 75GB of 4G data for a month with unlimited local, STD and roaming voice calls across any network and 100 SMS per day. The same plan previously offered just 40GB data and also packs in the data carry forward like the Rs 399 Nirvana plan. 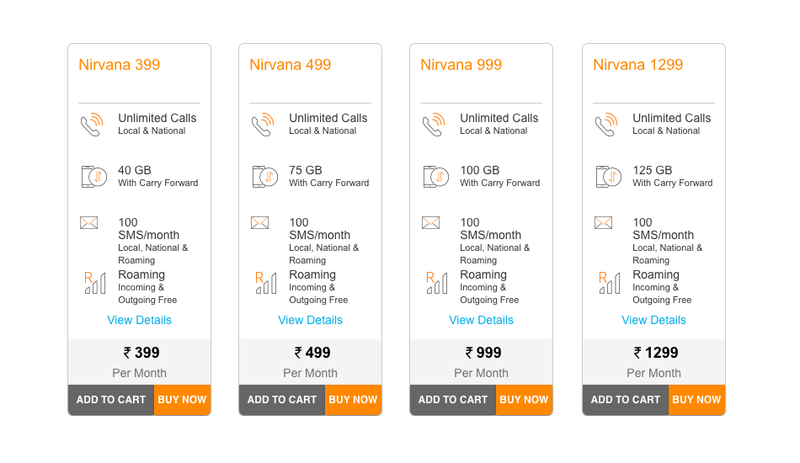 The Rs 999 Nirvana plan now offers 100GB of 4G data with a carry-forward option of up to 200GB and the same benefits like that of the Rs 499 plan. Lastly, the Rs 1,299 Nirvana offers a total of 125GB of 4G data with data carry forward of up to 200GB every month. Users can now fly enjoy unlimited voice calling across the country but also 100 minutes of international calling to the US, China, Canada, Hong Kong, Singapore, Malaysia and Thailand. India Nirvana users will be able to Idea Phone Secure subscription which offers protection against damage, theft or virus for your smartphone if you choose the Rs 499 plan or above. Idea is also providing 12 months of Idea Movies & TV and Idea Music membership to all Nirvana postpaid subscribers with free subscription to Idea Select for plans above Rs 499.